Any day you can use the word “homunculi” is a good day. Plus, pile of flaming monsters. In reality, the Boy and the Girl are actually ridiculously well-behaved. Sometimes I try to encourage them to misbehave just because it seems unnatural to me that children should be so well-mannered and so little trouble. However, they are so good that they won’t be bad even when I tell them to. They cheerfully execute chores with no grumbling or backtalk and very little procrastination. When I was little, though, this was pretty much my attitude. Why should I slave away for my parents? Taking care of us was my mom’s job, after all; I shouldn’t have to do it for her. Also, I really liked playing with fire. Since we’re talking about comics, I just read the best novel anybody ever wrote about writing comics. 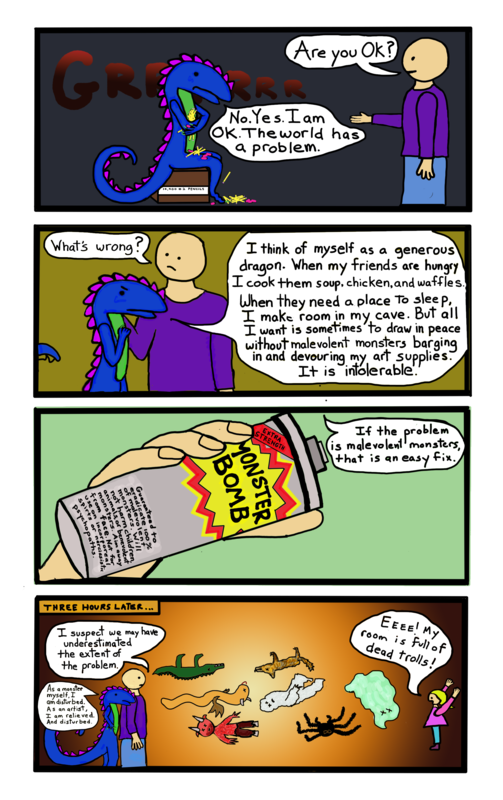 This entry was posted in Comics, Dragons, family and tagged chores, comics, dragon, fire, kids, monsters, The Man, webcomic on September 29, 2014 by littledragonblue. Warning: Monster Bomb has been found to cause cancer in giant mutant laboratory rats in the state of California. It probably doesn’t come as a surprise that certain real-life experiences informed this comic. As it is a comic, the retelling of the story shall be shaped to be more palatable than it was in real life. Recently, we hired a contractor to relocate our laundry facilities from the utility room to the the front hall closet, and to turn the utility room into a bedroom. Unbeknownst to Man or Dragon, the contractor neglected to adequately seal the drain in the old utility room. In addition, although he was asked repeatedly to leave the futon cover on the futon, a certain human insisted on removing the futon cover from the futon and throwing it over the not-sealed-up drain, for reasons which have yet to be revealed. In this part of the country, desperate monsoons dump inches of water on the city in short periods of time. This, naturally, causes the sewers to temporarily become engorged. This of course, inspires certain creatures–for the sake of my readers’ comfort, I shall refer to these subterranean terrors as “marshmallows,” although anyone who has lived in a city knows what comes up out the sewers when it rains; however, let’s just say it was marshmallows–these marshmallows are inspired to come up out of the sewers through whatever means of egress they find. So, when the marshmallows came up out of the sewers through the drain, they found a lovely little marshmallow habitat in the form of the wadded up futon cover, which was much nicer than the sewer. The marshmallows thought it would be more pleasant to relocate to the futon cover than return to the sewer. It was not until a few days after the rain that this development was discovered, by which time a truly nauseating number of marshmallows had infested the house. The Man handily obtained a Marshmallow Bomb, which is an effective tool for murdering marshmallows without getting ones hands dirty, except that its use reveals the true extent of the marshmallow infestation; more than a week later, dead marshmallows, lying on their back with their horrible dead marshmallow legs in the air, still appear in the corners. 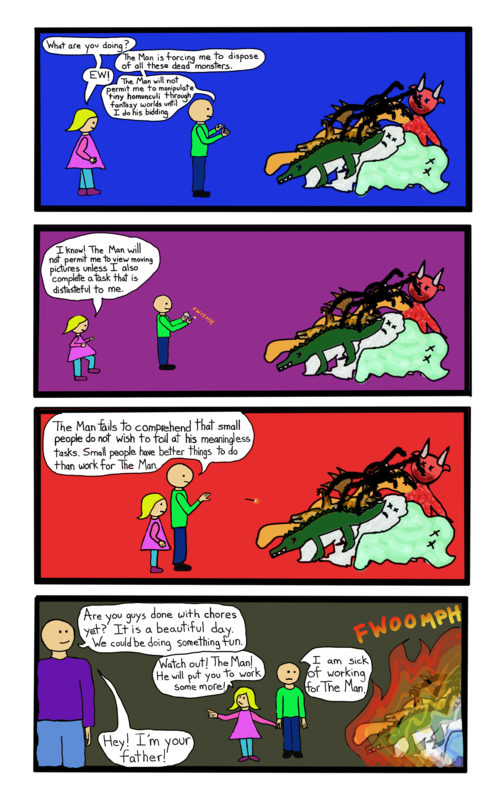 But this comic puts it all into perspective. Marshmallows are less dangerous, and easier to dispose of, than dead devils, wyrms, wargs, yetis, blobs, giant spiders, trolls, and weird alligator things with inexplicably long legs. 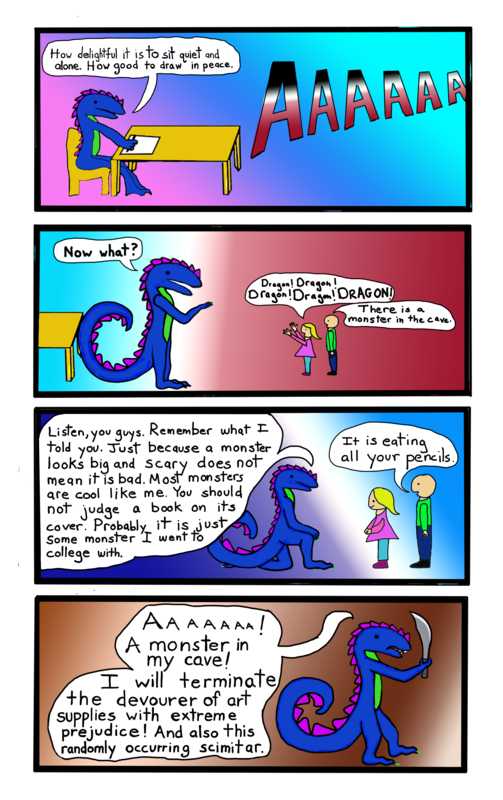 This entry was posted in Comics, Dragons and tagged comic, dragon, infestation, monster, monster bomb, webcomic on September 26, 2014 by littledragonblue. Who Shall Say Where One Ends, and Where the Other Begins? A goodly percentage of my friends believe that you can never start celebrating Halloween too early. 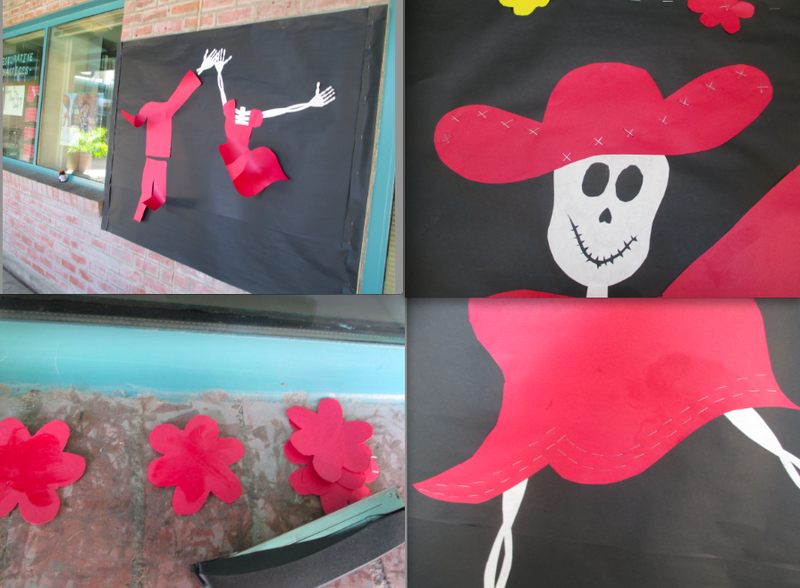 Since moving to Tucson, I get more excited about All Souls’ than Halloween, and this year I decided to create a Dia de los Muertos feel for the early autumn bulletin board. I also documented a lot of my process. 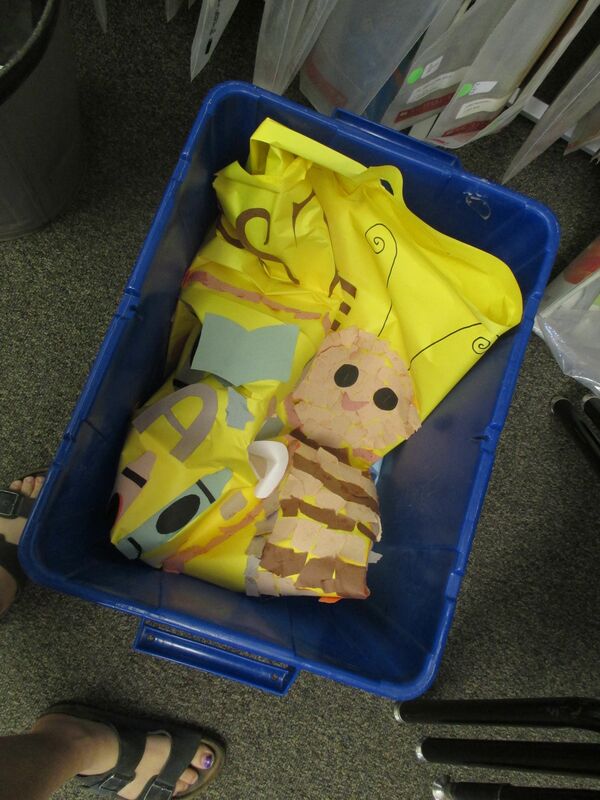 The welcome back-to-school butterfly has faded and died, and moved on to a new journey via the recycling bin, and we move from a symbol of transformation and life to a symbol of permanence and death: the calaveras. This little sketch was undertaken at 3 a.m. the night before, which is not bad. 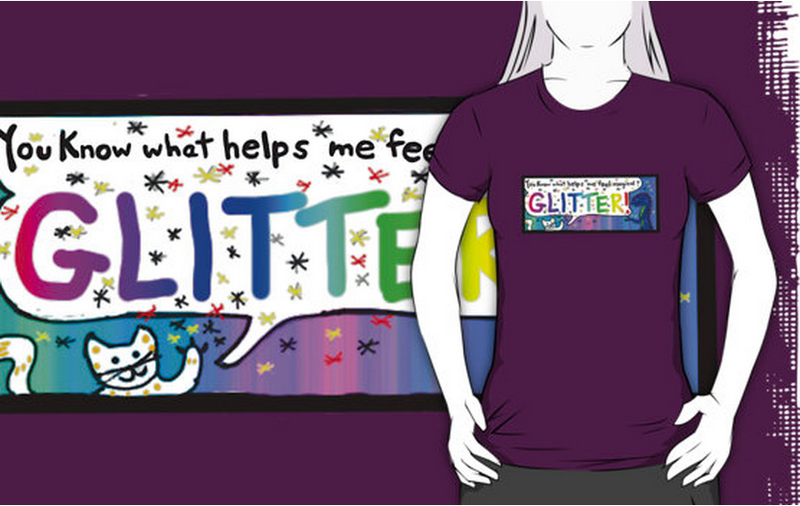 Sometimes I get in there with very little idea of what I actually intend to create. This is the first time I’ve ever made a thumbnail. You know that metric ruler belongs to the elementary school, and you know I’m the only one who uses it. Clockwise, from top left: blank background, dress based on a traditional folklorico design, pieces laid out inside, scalpel for interior details. To begin, I tear down the old bulletin board, then get some butcher paper and create a new background, which takes 2 layers of paper and a lot of staples. I sketch out the individual pieces freehand and then cut them out with a pair of scissors, but for the interior details, I’ll often use a small blade. Everything went smoothly up to this point; although I often feel a panicky sense of self doubt at the beginning, worrying if my art skills are good enough to pull off whatever I see in my head, getting the shapes out of the paper ended up being a simple process. 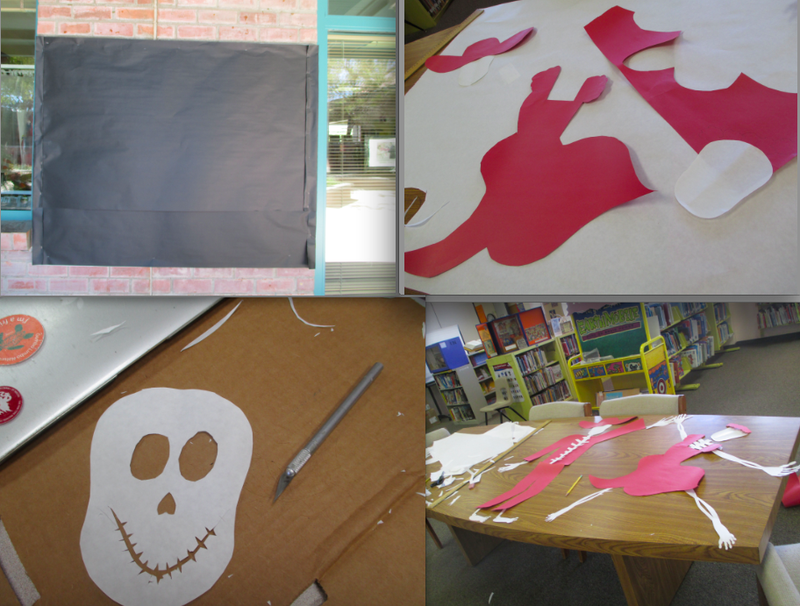 Transferring the cut-outs from the table to the bulletin board can be more of a challenge. For one thing, it’s windy out there, and for another, gravity works against me. Pretty much the first thing I did was accidentally dump half a bottle of rubber cement onto all the clothes while trying to place them, so I had to stop and clean that up. After that, things moved slowly, but with less incident. Clockwise from top left: wind ruffles the first pieces; staples create detail in the sombrero; staples create detail on hem; a few flowers. A combination of rubber cement and staples seems to be the best choice for affixing paper to paper. The cemented edges may loosen over the next few weeks, but the staples will keep them from coming completely apart. The staples keep the entire design up; if I don’t use enough, sometimes the wind picks the paper up and steals it away. This has happened a few times, and once I never found it again. So, I try to use the staples as design elements. Instead of adding stripes to the clothing, I’ve used staples to create the accents. When the skeletons were satisfactorily placed, there wasn’t room for much text, and I couldn’t think of anything appropriate, so I just added some more flowers to keep things lively. This was a relatively fast design: four hours from start to finish. Cutting letters probably would have doubled that. I’m pretty satisfied with the finished product, although I liked the faces better in my sketch. At any rate, this seems like a good way to kick off the season. 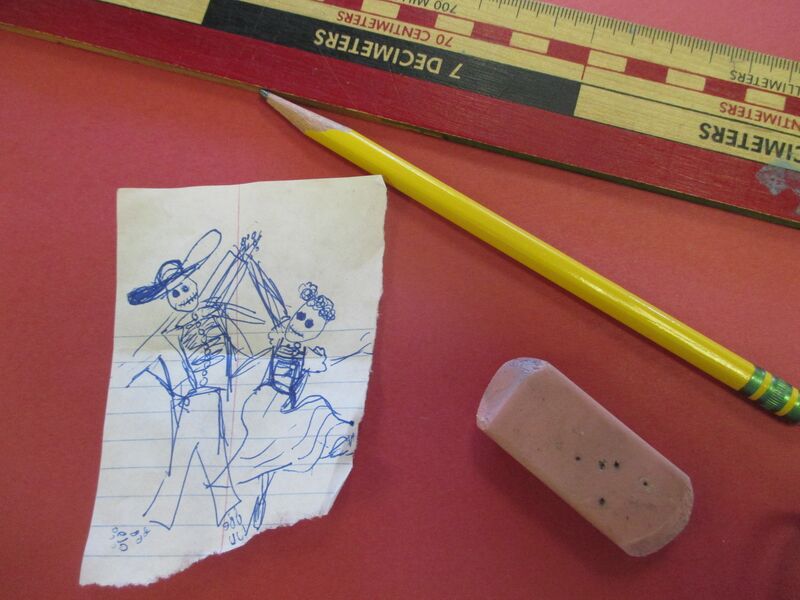 Happy Halloween, Samhaim, Dia de los Muertos, All Souls, what have you. In October, things die, and we rejoice in the fact that we’re still alive to lament their passing. 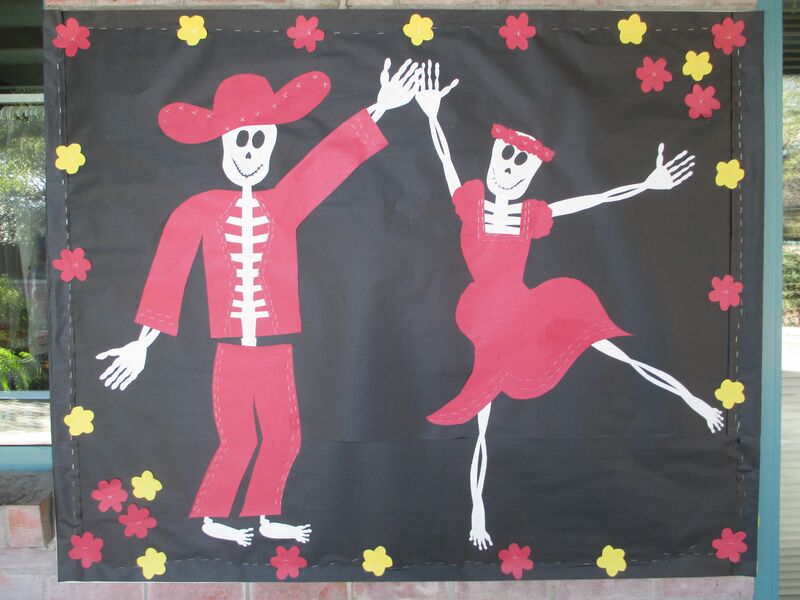 This entry was posted in Bulletin Boards and tagged all souls, art, bulletin board, calaveras, cut paper, dia de los muertos, folk art, halloween, paper, skeleton on September 25, 2014 by littledragonblue. Some monsters have a lot of chutzpah. Maybe it’s a bit of an exaggeration, but in general, I don’t think I’m the only artist who deals with bizarre distractions coupled with an attrition of art supplies. If I had a dollar for every time I had to stop what I was doing to figure out what happened to the stylus for the Wacom tablet, I could buy a new stylus every single day, and while I own literally hundreds of pens and pencils, laying my hands on one when it’s needed can become a bit of an ordeal. Poor Dragon has so much more to contend with. 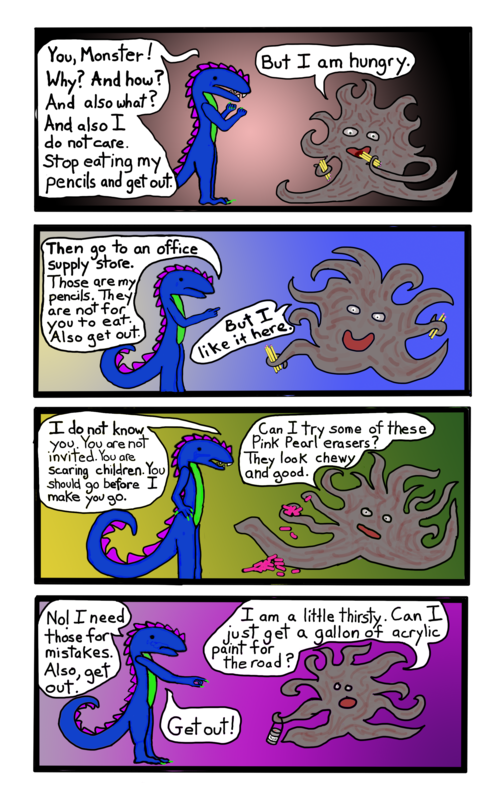 This entry was posted in Comics, Dragons and tagged art supplies, distraction, dragon, erasers, monster, paint, pencil, webcomics on September 24, 2014 by littledragonblue. For ten years, I’ve lived in the Sonoran Desert, where we enjoy 330 days of sunshine every year. It may be hot, but it is also beautiful, full of sharp contrasts and luscious details. This agave had reached the end of its life cycle. After sending up the shoot and flowering, the plant will die, but for a brief, breathtaking moment, it resembles a flaming torch. If all else fails, you can always make tequila. This drawing is based on a photograph I took over the summer; I had a 2-day window in which this plant exhibited these gorgeous colors. In fact, I wanted to paint a hibiscus today, but I couldn’t lay my hands on the right reference image. 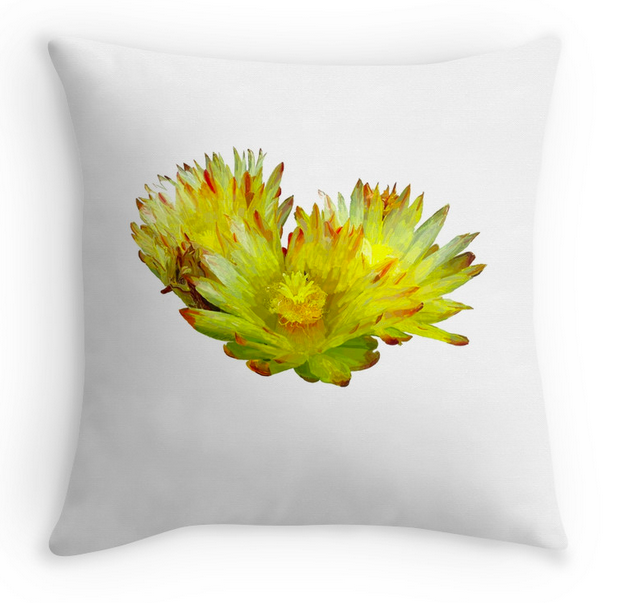 This lovely design is available for purchased on a variety of fine products in my shop. 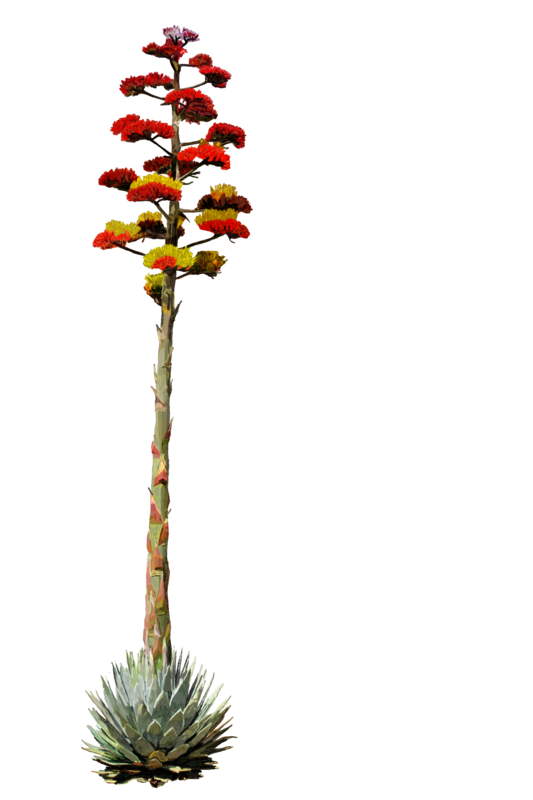 This entry was posted in art, Clothing, Digital Paint and tagged agave, bloom, blossom, century plant, desert, flowers, nature, plant, red, sonoran desert, xeriscape, yellow on September 23, 2014 by littledragonblue. Just what you want to hear first thing on a Monday morning. A more comical weapon than a scimitar did not come immediately to mind. It’s sort of funny looking and the name sounds slightly amusing. Can anyone think of funnier weapons? Actual weapons that look or sound funny, not ridiculous things being used as weapons. The first person I asked suggested a typewriter on a chain. That’s funny. But it’s not a real weapon. You might use it in a pinch, but you would never take it into battle. You don’t take a typewriter on a chain to a scimitar fight. This entry was posted in Comics, Dragons and tagged dragon, dragon comics, kids, monster, pencils, scimitar, weapons, webcomics on September 22, 2014 by littledragonblue.